Scientists at the Max Planck Institute for Polymer Research (MPI-P) in Mainz and the National University of Singapore have attested that the thermal conductivity of graphene diverges with the size of the samples. This discovery challenges the fundamental laws of heat conduction for extended materials. Davide Donadio, head of a Max Planck Research Group at the MPI-P, and his partner from Singapore were able to predict this phenomenon with computer simulations and to verify it in experiments. Their research and their results have now been presented in the scientific journal Nature Communications. "We recognized mechanisms of heat transfer that actually contradict Fourier's law in the micrometer scale. Now all the previous experimental measurements of the thermal conductivity of graphene need to be reinterpreted. The very concept of thermal conductivity as an intrinsic property does not hold for graphene, at least for patches as large as several micrometers", says Davide Donadio. Are material constants alterable after all? The French physicist Joseph Fourier had postulated the laws of heat propagation in solids. Accordingly, thermal conductivity is an intrinsic material property that is normally independent of size or shape. In graphene, a two-dimensional layer of carbon atoms, it is not the case, as our scientists now found out. With experiments and computer simulations, they found that the thermal conductivity logarithmically increases as a function of the size of the graphene samples: i.e., the longer the graphene patches, the more heat can be transferred per length unit. This is another unique property of this highly praised wonder material that is graphene: it is chemically very stable, flexible, a hundred times more tear-resistant than steel and at the same time very light. Graphene was already known to be an excellent heat conductor: The novelty here is that its thermal conductivity, which was so far regarded as a material constant, varies as the length of graphene increases. After analyzing the simulations, Davide Donadio found that this feature stems from the combination of reduced dimensionality and stiff chemical bonding, which make thermal vibration propagate with minimal dissipation at non-equilibrium conditions. In the micro- and nano-electronics, heat is the limiting factor for smaller and more efficient components. Therefore, materials with virtually unlimited thermal conductivity hold an enormous potential for this kind of applications. Materials with outstanding electronic properties that are self-cooling too, as graphene might be, are the dream of every electronics engineer. Davide Donadio, an Italian-born researcher, already dealt with nanostructures of carbon, crystallization processes and thermoelectric materials during his studies in Milan, his research stays at the ETH Zurich (Switzerland) and at the University of California, Davis (USA). Since 2010, he has been investigating, among others, thermal transport in nanostructures using theoretical physics and simulating the atomic behavior of substances with his Max Planck Research Group at the MPI-P.
A simplified explanation of what mechanisms are proposed to explain this behaviour would be appreciated. the info you seek is behind the pay wall of Nature Communications as the article explains. This is incredible. I now wonder if a mechanism/method could be made/discovered to develop materials essentially reverse/slow the thermal conductivity properties on a logarithmic scale and make them less prone to the time-dependent loss of heat? I can only imagine the implications of such discovery to any kind of engine out there. The electrons at the surface of graphene are compressed mutually in similar way, like the vagoons inside of squeezed train. Therefore they don't mediate the heat via mutual collisions, but in waves. And these waves spread the better, the larger the graphene flake are. Thermal conductivity will not really be unlimited. Xiangfan Xu, Luiz Felipe Pereira, Baowen Li, and all the team should be acknowledged. Thanks. Now, can you explain to a culturally-challenged American what a vagoon is? Does ANY material have the exact same characteristics when you take only one layer of atoms? can you explain to a culturally-challenged American what a vagoon is? Probably the railway car or its carriage. I do apologize for impertinent challenge. Every material is indeed unique, but most of materials which consist of single layer (like the molybdenum disulphide) do share a similar characteristics. The superconductors and topological insulators work similarly too. IMO the trick here is, when the electrons are constrained to low-dimensional structure, they tend to behave like the atemporal Dirac fermions. It's rather difficult to describe such a behavior without math, but you can try to imagine the behavior of floaters at the stormy water surface, which aren't floating freely, but they're hanging on string parallel with water surface like the beads on abacus. The floaters will move jerkily, because the low-dimensional projection of harmonic motion is not harmonic anymore. "Thermal conductivity will not really be unlimited. - DD"
Fourier is safe not only from extrapolation. Practicalities are obstacles too. Solids of finite scales. An intriguing discovery to be sure, but I do wish they'd stop calling graphene a '2D' material... it's not. It's just that one of the 3 dimensions is very, very small. There is important aspect of new physics, that the truth is not selfevident there (a multiverse?). So when you're insisting on some truth, you should always tell the conditions of your stance, i.e. with respect to what such a truth remains valid. The graphene is indeed "very thin" from practical perspective and indeed 3D material from purely formal mathematical perspective. But with respect to electron orbitals its thickness is already not so great - and this is what actually matters here. When the electrons will get constrained in their free motion with some structure (geometrically frustrated), then the structure should be considered low-dimensional and the electrons will tend to undulate in another dimensions instead. When we squeeze some particle into small volume, its internal energy content cannot disappear, so that the character of oscillations will change into quantum jitterbugging and the particle will change into Dirac fermion. And lots of experimental work is being done of the kitchen table. ... Does ANY material have the exact same characteristics when you take only one layer of atoms? writela: "... IMO the trick here is, when the electrons are constrained to low-dimensional structure, they tend to behave like the atemporal Dirac fermions. ... imagine the behavior of floaters at the stormy water surface, which aren't floating freely, but they're hanging on string parallel with water surface like the beads on abacus. The floaters will move jerkily, because the low-dimensional projection of harmonic motion is not harmonic anymore ..."
Like whale oil on water calms the stormy waves? 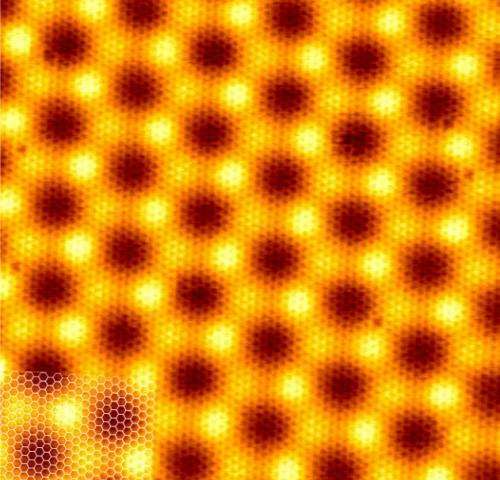 but I do wish they'd stop calling graphene a '2D' material... it's not. It's just that one of the 3 dimensions is very, very small. Speaking of dimensions with something at that level is iffy at best. We're not talking 'solid balls', here. The "2D" in 2D-materials does refer to the crystalline structure (Miller-Bravais Index if you so will). Which is 2D, not 3D. Probably not - though you can't make a 2D sheet from just any material. Some effects (edge/plane effects) average out in bulk materials. So we should expect some weird stuff happening when go to geometries where these effects play a significant role. Writela: "There is important aspect of new physics, that the truth is not selfevident there (a multiverse?). So when you're insisting on some truth, you should always tell the conditions of your stance, i.e. with respect to what such a truth remains valid. ..."
"... The graphene is indeed "very thin" from practical perspective and indeed 3D material from purely formal mathematical perspective. But with respect to electron orbitals its thickness is already not so great - and this is what actually matters here. ..."
Do most atomic material's electron orbits shrink when cold, expand when warmer ? No. The orbitals are quantized. You do get a broadening of spectral lines with higher temperatures as the atoms, as a whole, move (doppler shifts), but you do not get 'squeezing' of orbitals.